Web Conferencing to click and go! Apache OpenMeetings is a Audio/Video conferencing software that allows you to instantly set up a video conference in your browser. You can use your microphone and webcam, share documents on a white board, share your screen or record meetings. You can use it in education, training, ad-hoc meeting or build your very own Video-Conferencing platform with it. We provide hosting and services as well as customization and integration. You can also sign-up for free and try out! 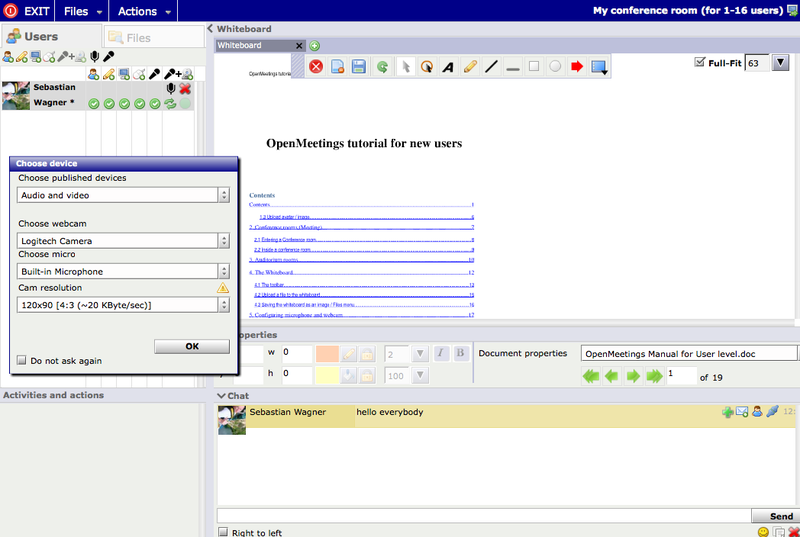 OpenMeetings is translated in over 30 languages and there are many installation as well as integration options available. You can integrate using Atlassian Jira or Confluence Enterprise Wiki, Asterisk VoIP server, Drupal, Joomla, WordPress or any other Website and CMS and there are also LDAP/ADS connectors available. OpenMeetings can be installed on Virtual and Dedicated Servers as well as on Amazon Cloud or XEN Virtualized environments.